Prepare the seaweed according to the instructions on the pack. Heat the oil in a large frying pan or wok, add the garlic, scallops and prawns and stir-fry over a high heat for 2-3 minutes or until the prawns are pink. Stir in the fish sauce and cook for a further minute until piping hot. 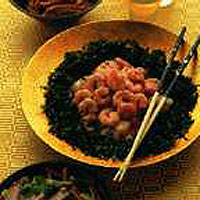 Arrange the seaweed around the edge of a hot serving plate and spoon the scallops, prawns and any juices into the centre. Serve immediately.